1) MODS. 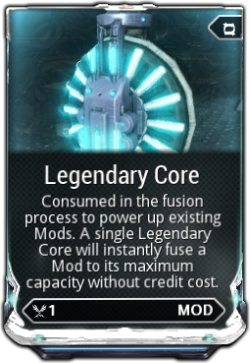 All Mods in your inventory are eligible for trade, including Legendary Cores and Rivens. There is no Rarity restriction (you can trade a Rare for an Uncommon). Mods that you have equipped on items will display a blue icon on the bottom right corner of the Mod. These are eligible for trade as well, but you will be notified that the mod will be taken off the equipped item(s). 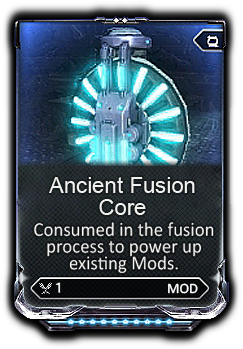 Exception: You may not trade away Precept mods for any Companion (Sentinel/Pet) you own, unless you have duplicates of the mod. This is similar to the rules in place for dissolving those mods into Endos. 2) KEYS & RELICS. Mission keys and Relics can be traded. Specific components like Mutalist Alad V Coordinates are also tradeable. Clan Keys cannot be traded. 3) PLATINUM. Only Platinum that you have purchased will be eligible for trade. There is no minimum/maximum amount of Platinum you can trade. Your starting 50 Platinum cannot be traded, and moving forward, any Platinum you are rewarded (contests/livestreams, promotions, etc.) will not be eligible for trade. Platinum that you obtain through trading is considered "purchased". 4) PRIME WEAPON PARTS. Any prime, wraith and vandal weapons that have individual pieces that are used to craft them in addition to the main blueprint may be traded. Only prime parts that drop as parts can be traded, you cannot complete a trade if you do not meet the Mastery requirement. 8) ARCANES Arcanes are tradeable. 9) MODS & WEAPONS from BARO KI'TEER and SYNDICATES. Any special mods and any UNUSED weapons from Syndicates and Baro Ki'Teer may be traded (keep in mind that even 1 XP on a weapon will make it untradeable in game). 10) LANDING CRAFT BLUEPRINTS. All Landing Craft blueprints may be traded. 12) KUBROW & KAVAT IMPRINTS. All Kubrow and Kavat Imprints can be traded. 13) FOCUS LENSES. This only applies to normal Focus Lenses, Greater Focus Lenses cannot be traded, Eidolon Lenses are not tradable. Note : You are NOT allowed to sell items from another game in Warframe, . How do I build the Trading Post? You will be able to place the Trading Post as a decoration in the Dojo. Hit Escape to bring up your Dojo menu and select the Place Decorations option on the menu. Select the Trading Post from the list of available decorations. Wait for Trading Post to be done building or rush with Platinum. Trading Tax is a Credit fee applied to all items you receive in a trade. Trading Tax is based off the rarity of the items you will receive. The rarer an item is, the more you must pay in Trading Tax. The Trading Tax each player must pay appears below the player's profile image on the Trade screen, and will update as the items in the trade change. Please do not do this. While your intent may be innocent, if your contest will rely on the Warframe Trading or Gifting systems to send items or Platinum to players directly we must HIGHLY discourage this. This is not the intent of these systems and there is little to differentiate this sort of contest from possible fraudulent or illegitimate transactions between parties. Contests from the Warframe Community team (Dev Streams, Primetime, etc), Fansites, and partners will use the code redemption system, and are the only sanctioned method of conducting a contest with players. Digital Extremes does not offer support for unsanctioned giveaways or contests. The Clan Trading Tax is an additional tax that is optionally set by a clan. It is calculated as a percentage of the normal Trading Tax. When a trade is completed, the credits from the Clan Trading Tax will go in the hosting clan's Vault. On the "Trading Post" screen click the "Edit Clan Tax" button, and enter a tax percentage between 0 and 100. You may change the Clan Trade Tax rate only if you have the "Treasurer" role. I'm worried about receiving Gifts I do not want from Random people, is there any way I can prevent this? There are gift settings you can change in the Options menu that will limit the people who can send gifts to your account. The options available in your GamePlay settings tab are "All, Friends Only or None". 6) By clicking on one of your 4 empty slots, you can choose between the items to trade. When you select an item, the recipient will be charged a “Trading Tax” (Credits) based on the rarity of the item traded. Each player must have enough credits to pay their respective Trading Tax, or the items cannot be traded. Platinum can be traded by only one of the players, and in only one of the trading slots (no trading Plat for Plat). Click the "Check when ready to trade" option when you're finished selecting your items. 8) Once both players are ready to trade, a new button will appear to accept the trade. Once the "accept trade" button is hit, you will see a fancy trading animation and the trade will be finalized! “Founders Codes”: Codes to unlock Founders' content in Warframe do not exist. Refrain from trading with players that are offering items/codes that have not been announced or made available by Digital Extremes. A Note on "Real Money Trading" and "Special Deals"
You might see players (either in-game or on various websites) offering special deals on discounted Platinum. Note that these Platinum sellers are not legitimate: please visit our website for a full list of authorized Platinum retailers. Please also note that the in-game trading system is intended only for equitable trades between players, not for trading large amounts of Platinum between accounts. If you purchase your Platinum from a legitimate source, it will be deposited directly into your account ie you will not need to provide access to your account to anyone, nor will you need to make a trade to receive it. And while we are always happy to see how generous Tenno can be with each other, we strongly advise that you approach any deals that seem too good to be true with caution. If a player you barely know offers to ‘give’ you a large amount of Platinum in exchange for relatively valueless items, there’s a good chance the Platinum was not legitimately obtained (for example, it might have been stolen from another player’s account, or it might have been purchased using fraudulent credit card information). If you have purchased Platinum through an unofficial 3rd party site or from another player, there’s a strong chance it was also obtained in the manner described above. Should an investigation find that you received Platinum from one of these fraudulent sources, it can and will be removed from your account. With that said, the vast majority of players who use the trading system are honest and respectful, and you should not hesitate to trade with them. In the rare event that you find yourself unwittingly caught up in one of these situations, please contact Warframe Support and we will be happy to work with you to resolve the issue and get you back into the game as soon as possible. A final topic to cover is the sale or purchase of accounts. A Warframe account may only be accessed by its account creator - the transfer/sale/purchase of a Warframe account not only might result in the account being suspended - but you could easily find your fancy new Warframe account being reacquired at any given time by its original owner! The original owner of an account will have a great deal more knowledge about the account than you and if they contact support claiming that their account was stolen, its likely to be returned to them - leaving you with nothing. Any account that has had its login info shared cannot be considered secure, so never share your account info with any other players and conversely don't be asking your friends for theirs. Consider a situation where a group of players are sharing an account...any disagreement within the group might result in one of those players trying to obtain sole control of the account by either changing its password, or contacting support and suggesting they are the original owner and the other players are invaders. The only safe option is for that group of friends to each have their own account to play the game. Always remember, friends don't share friend's accounts! If you are concerned about a potential leak of your login info, feel free to change your password and contact support so we can help ensure your account is locked down as securely as possible and assuage any fears you might have in this regard.